Before the 96th Indianapolis 500 race on Sunday, "Back Home Again in Indiana" will be sung, and by the end, the winning driver will drink his Victory Lane bottle of milk. But superhero-esque cars and an all-female racing team are adding a few changes to the event's storied traditions. The Brickyard is the historic nickname for the Indianapolis Motor Speedway. It was built in 1909 as an automobile testing ground to support the state's growing auto industry, according to the event's website. However, the track was soon used for racing purposes. Today, it remains the world's largest seating facility, with 250,000 permanent seats. The oval itself, which covers 253 acres, can fit Churchill Downs, Yankee Stadium, the Rose Bowl, the Roman Colosseum and Vatican City, according the site. Originally constructed with crushed rock and tar, 3.2 million paving bricks were laid on top later in 1909, giving rise to the Brickyard nickname, according to the event's website. Over the years, the brick has been covered with asphalt - except for a 36-inch strip of the original bricks that have remained intact and uncovered at the start/finish line, known as the "Yard of Bricks." The winning driver and team of the Indy 500 kneel for a tradition started in 1996 of "kissing the bricks." Katherine Legge isn't the first woman to qualify for the Indy 500 - she's actually the ninth ever - but Legge is making the most of her position. The rookie driver brings an all-female racing team with her to the Indy, the first ever in the history of the race. She is also sporting a Girl Scouts logo on her helmet and representing STEM (science, technology, engineering and mathematics) as an ambassador. For cars that can race at 224 mph, speed, efficiency and safety measures reign supreme. And given the tragic death of two-time Indy 500 winner Dan Wheldon in a 15-car crash at the Las Vegas Motor Speedway in October, this is the year of safety measures. Wheldon died when his vehicle became airborne and hit a fence pole. The new design is supposed to prevent cars from becoming airborne. Italian firm Dallara has created the new DW12 chassis, named for Wheldon, who helped test the car before his accident. Wider cockpits, wheel guards, a smaller engine, vertical wings on the side panels and energy absorption foam have all been added to keep drivers safer on the track, and in the event of an accident. It's going to be a hot one on Sunday with temperatures expected to reach the low 90s. The humidity could actually be the worst enemy. The event's website has warned spectators to come prepared. Drinking plenty of water, wearing loose-fitting clothing and wide-brimmed hats or taking shade breaks should help people beat the worst of the heat. But if all of that still leaves spectators feeling wilted, there are also 78 "misting stations" on the grounds to help cool people down fast. Given the heat warning, fans may cut back on some of the track's signature fare, but it won't stop diehards from eating their favorite things. The Indy Dog, Brickyard Burger, Track fries, bratwurst and elephant ear (fried flat dough with butter, sugar and cinnamon) are all part of the tradition. But the breaded pork tenderloin sandwich is king at the race. A favorite in the state, it's a bit like schnitzel in a bun. Are you an Indy 500 fan? Let us know your personal traditions, or how you'll be celebrating in the comments below. Filed under: Auto racing • Automobiles • Indiana • Sports • U.S.
Lucky Larroso didn't think she was in any danger as she crossed West 57th Street in New York while typing a text message. Very little thought goes into either task. But what happens if you combine walking and texting? “People aren’t watching where they are walking. They’re texting, they’re on their cell phones, they have their iPods on, and they’re just not aware of their surroundings,” said Thomas Ripoli, the police chief in Fort Lee, New Jersey. There has been an increase in the number of pedestrians struck by cars in his town this year. Four such incidents ended in death. So Ripoli went on a mission. He told his cops to look out for people who are not paying attention while crossing the street. “Our focus is to make people aware of their surroundings and to keep their eyes focused on where they’re going,” Ripoli said. Is texting while walking really dangerous, though? Most of us think we’re capable of doing more than one thing at once. Professor Earl Miller said that may be an illusion. In the case of texting while walking, Miller says that cost is potentially the loss of life. His studies show that the brain has a limited capacity to take in information at any one time. So if you text, or look at an iPad, or even just listen to music in your headphones while walking, your brain does not receive all the information it may need to keep you safe. Texting while driving laws are becoming commonplace across the country. 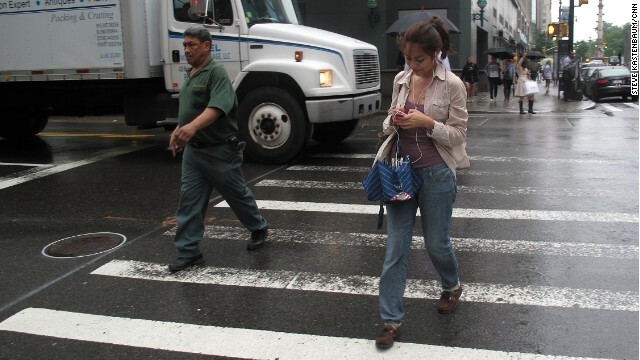 So far no one has passed a texting while walking law, but that could change. In New York, a state senator wants to ban using cell phones, iPods and other gadgets while crossing the street. A local lawmaker in Arkansas has proposed similar legislation. Open thread: Who are you honoring this weekend? As the country heads into the Memorial Day weekend, the traditional kickoff to the summer travel season, there are almost 1.5 million U.S soldiers, sailors, airmen and Marines deployed in war zones or combat missions worldwide. 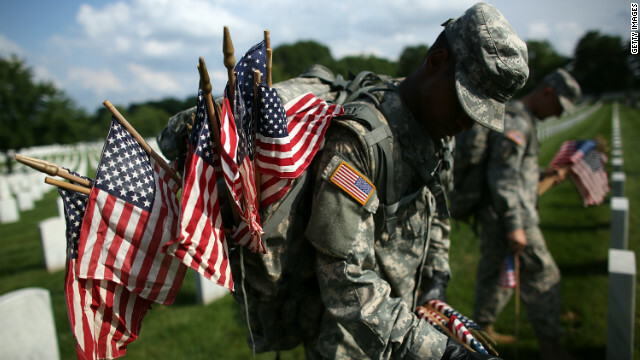 So far, more than 6,400 U.S. servicemen and servicewomen have died in the wars in Iraq and Afghanistan - 3,000 in Afghanistan alone - and at least 48,000 more have been wounded. We encourage you to spend some time looking at our Home and Away feature, where you can discover the individual stories of the fallen. Do you have a friend or family member in service? Tell in the comments who you are honoring this weekend.